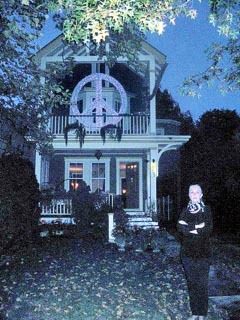 Coaster Photo – Asbury Park resident Linda Myers stands outside her home which features an illuminated peace sign. Traveling on Asbury Park’s First Avenue between Main Street and the beach, one is likely to have seen the taller-than-an-adult, lighted peace sign on the second-floor balcony of a house. The peace sign, eight feet in diameter, went up as a political statement about eight years ago – “This was my response to (President George W.) Bush starting a war,” she said – and it simply remains in place. F-words of the clean kind: She grew up on a farm in her native Cranbury, where her maiden name, Stults, is easily recognizable as one of the old surnames of the area; studied fashion at what is now LIM College in New York City. “(But) I never worked in the fashion business,” Myers said. She, however, did work as an interior decorator in Houston. She said she is just naturally creative. She and her mother operated a flower business in Hightstown (from about 1975 to 2001) and Plainsboro (about 1981 to 1998). Both were called Country Florist and Greenhouse. When she retired from the flower business – Myers from the Plainsboro store, her mother continuing the Hightstown shop – in 1998, she started doing artwork with picture frames at the suggestion of one of her flower shop workers. Myers rounds up old frames from such places as yard sales and flea markets. Myers glues frames together, smaller ones within bigger ones, “until they marry,” she said. She paints them, forming her style of artwork by combining someone’s earlier craftsmanship. Some are recessed, some are even at their surfaces. Some could have a mirror or retro glass in the middle. She works with Keatorbilt Cabinetry Design and Millwork of Asbury Park if the frames have to be cut or that sort of thing. Most of the frames are priced at more than $1,000 and go up to $3,500, Myers said. A few days before terrorists struck on American soil on Sept. 11, 2001, Myers moved from Cranbury to Asbury Park. But her daughter lives on the same Cranbury farm Myers grew up on. Myers once lived with her then-husband on a 49-foot boat they owned in Flushing Bay in New York City. “We would walk from the boat to the subway and take the 7 Train into town everyday,” she said. Myers’ three-story house – built, she figures, between 1880 and 1900 — is a reflection of her artistic side. On the railing of the second-floor balcony, for example, is a fiberglass female form covered with sphagnum moss. “She’s just a work in progress,” Myers said. The sphagnum moss female shares the balcony with the peace sign. Linda Myers’ Fabulous Frame Art can be reached at telephone 609-203-7223, email Linda@fabulousframeart.com, website fabulousframeart.com.